Hello and welcome to Cyclingnews' live coverage of the 21st and final stage of the 2016 Giro d'Italia, a 163km trip from Cuneo to Turin. Hello and welcome to Cyclingnews' live coverage of the 2016 Giro d'Italia. This is it. This is where the road ends. The 21st and final stage. It really has been a great Giro and we're going to see it off in style. So, a nice easy start to the day with a gentle downhill, where no doubt everyone will be in relaxed mood - some celebratory. We then hit Turin for some local laps where the sprinters - if there are any left? - will come to the for one last hurrah. It's a typical final stage to a Grand Tour. 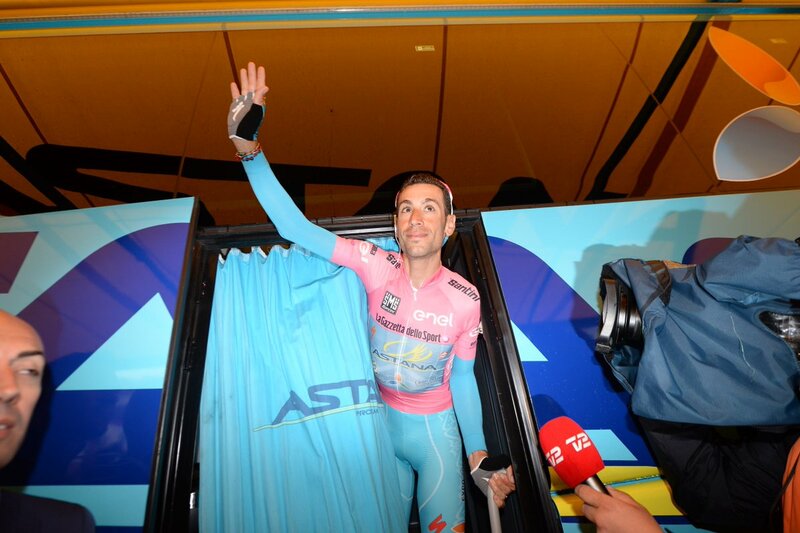 The winner of the Giro (barring accident or the extraordinary) emerges from his team bus. 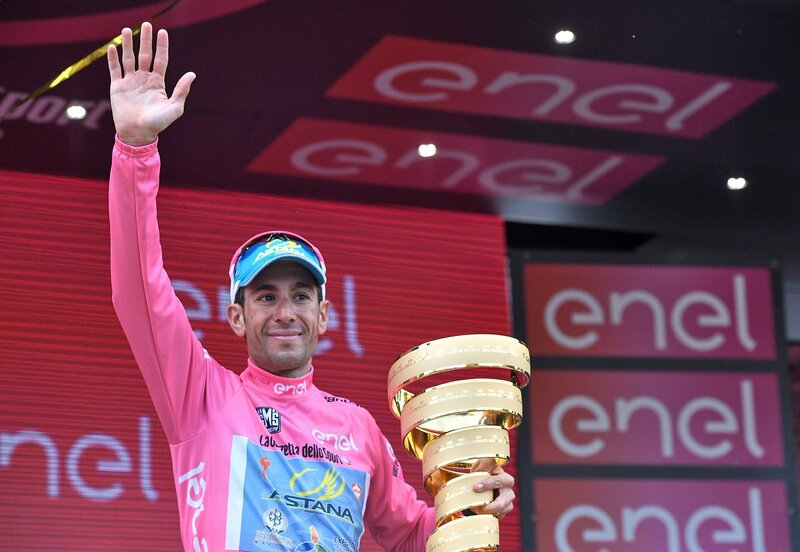 And this is what Vincenzo Nibali stands to win at the end of the day. The riders have all signed on and are about to roll out of a very wet Cuneo for what is set to be a leisurely day in the saddle. Let's just remind ourselves how Nibali has come to find himself in this position, because you'd have been laughed out of the room for suggesting this 48 hours ago. Here's our report from a thrilling stage 20 yesterday. This is how the general classification stands. And we're off! The riders have just been given the go ahead to begin the roll-out. Realistically, the red jersey is the only one that can change hands. Nizzolo leads with 185 points but Lampre-Merida's Diego Ulissi is second on 152, with Etixx's Matteo Trentin on 141. With two intermediate sprints and a sprint finish, there's plenty of chance for a points swing. Here is Nizzolo at the start today. The Italian won the red jersey last year but is known for his remarkable string of near misses in Giro sprints. He has never managed to win a stage and even when presented with the chance of his life on stage 17, with most of the top sprinters like Kittel and Greipel absent, the fates found a way to deny him as Roger Kluge took an unlikely solo win. Is today finally the day for Giacomo Nizzolo? As might be expected, the opening kilometres of this stage have been raced in relaxed fashion, with the peloton all together for the moment. 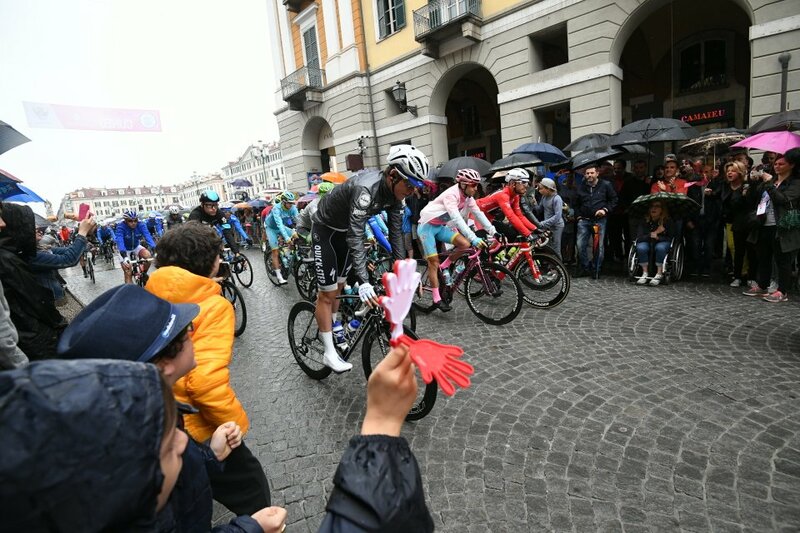 There was wet weather at the start in Cuneo and there may well be wet weather in Turin with dark clouds looming. The course is dry from about the half-way stage but the raining is moving north. There has been talk of neutralising some of the laps of Turin if the heavy rain does materialise. Organisers will no doubt have a plan in place and will make a decision once the race is nearer to Turin. Nibali and his Astana teammates are given the opportunity to indulge in a spot of celebration. There's a small crash involving some BMC and Orica-GreenEdge riders but it looks like everyone is bike on their bikes pretty swiftly. Nibali isn't holding back with his celebrations. The Italian rocked up at the start today with a completely pink bike, including a glossy pink paintjob for the frame. You can have a closer look in our gallery. This image just posted on Twitter by the Katusha team shows that the rain is indeed coming down hard in Turin. Katusha have also posted a video of the massive raindrops bucketing down in Turin. If the rain continues to come down like that it's going to make for a dangerous finale. The circuit isn't overly technical but there are two 90-degree bends inside the final kilometre. Lars Bak (Lotto Soudal) has abandoned the race. It seems he was caught up in that small crash mentioned before. The riders covered 35.9km in the first hour of racing. Leisurely. #Giro Unfortunately Lars Bak had to abandon the race after a crash. He probably has a fractured shoulder blade. We've covered around 55 kilometres so it won't be long until we reach the intermediate sprint point in Racconigi. That comes at around 63km. We're coming up to the intermediate sprint. Nizzolo, Ulissi and Trentin can all be expected to show an interest. Nizzolo does indeed strike out and he earns himself maximum points. Ulissi's teammate Sacha Modolo comes across second, while Trentin is third. There are more points on offer for the stage win that the intermediates but a good start for Nizzolo. However, you sense he'd trade in every single point to get his hands on that elusive Giro stage victory. The pink and red jerseys, compatriots Nibali and Nizzolo, enjoying a catch-up on this relaxed afternoon. 75 kilometres covered now and the next big event on today's stage is the feed zone. White jersey wearer and best young rider Bob Jungels (Etixx-QuickStep) on the right. What a Giro he's had - the Luxembourg rider is going to finish 6th overall. The average speed over the first two hours of 'racing' has been 39.2km/h. That's fairly quick, considering. In #Giro stage 21, the peloton will cover 8 times a circuit which includes cobbles and some pretty tricky corners. As the Etixx team said in that tweet, there are cobbles on parts of this circuit. They're not the small, jagged stones you might see in the Classics but rather wide large slabs. Still, could be slippy in the wt. Incidentally, the conditions have tried up in Turin, and the road surfaces appear to be dry. There are still dark clouds looming, though. We have our first attacks of the day! The LottoNL-Jumbo duo of Jos van Emden and Maarten Tjallingii make their way off the front and start trading turns. The Dutch duo have opened up a lead of 30 seconds. We've been through the feed zone and we're not too far away from Turin now. The leaders come into Turin - Torino in Italian tongue - and cross the finish line for the first time. Eight laps of this 7km circuit to come. The Lotto duo complete one of the laps and come across the line some 35 seconds ahead of the bunch, which is being led by Nibali's Astana. We've had confirmation that the race has been neutralised in terms of the general classification. The times have been taken on the first passage of the line, so there will be no worries about fights for position. Nibali, though, still has to finish the race to sew it all up. Attacks now coming on the second lap. Manuele Boaro (Tinkoff) and Gianluca Brambilla (Etixx-QuickStep) surge clear and there are others behind them who fancy getting involved too. These chasers are 35 seconds behind the leading duo. The peloton is a further 20 seconds back. Zhupa and Clarke have been dropped from this chase group. The heavens have indeed opened and the roads are going to be getting slippy once again. This is going to make for a risky finale. This chasing trio are attacking each other now. With the rain coming down they know that a few risks may make a stage win possible. They still only have 25 seconds on the bunch. The LottoNL duo are doing really well here and now have a lead of 50 seconds. The chasers are losing ground. There's a sizeable crash that leaves a few riders on the ground. Rigoberto Uran is on the deck and Esteban Chaves stops to check on his compatriot. Movistar's Jasha Sutterlin and Etixx's Pieter Serry also caught up. No one seriously hurt, it would seem. Uran gets back on his back and rides on with teammates. There are no worries about trying to get back onto the bunch as the GC times have already been taken and the stage has been neutralised from that point of view. Sutterlin was in fact injured in that crash. He has been taken away in an ambulance and therefore will not finish this Giro. Van Emden is riding hard to help Tjallingi go for stage glory. The pair have 45 seconds with 20km remaining. We're also hearing that Johann van Zyl has had to abandon the race after that crash. #Giro really sad news, despite getting up after the crash... @vanSnail had to abandon the stage and is on his way to hospital. That crash has added something of a sour note to the end of this Giro. 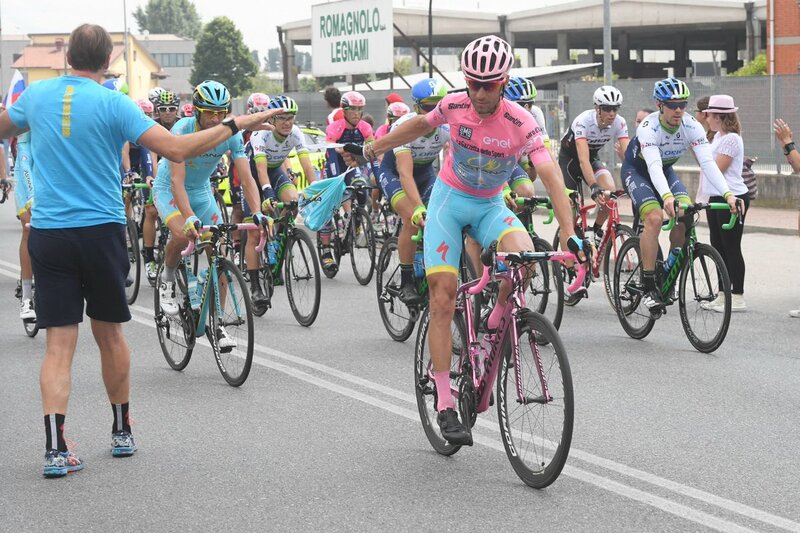 Two young riders in their first Giro, so close to reaching the end, having to end their race in hospital. Etixx and Lampre driving the peloton at a really high pace. Van Emden and Tjallingii have been pegged back to 20 seconds. Bob Jungels hits the front now and puts in a characteristically monstrous turn. Under 10 seconds now, the gap. Tjaliingii sits up. Van Emden ploughs on. Van Emden uses his time trialling skills to keep his lead at 10 seconds. It's difficult to see this lasting, though. Last lap for Van Emden and his lead is holding! And now, as the road heads uphill, Van Emden is caught. It's Sonny Colbrelli who hits the deck after making an attack. The Italian attacked by the barriers and then was flung to the ground. It's unclear if a spectator was involved or not. No other riders come down. All together with 5km to go. Jose Joaquim Rojas attacks. Nizzolo, Modolo, Trentin, Arndt all in there. 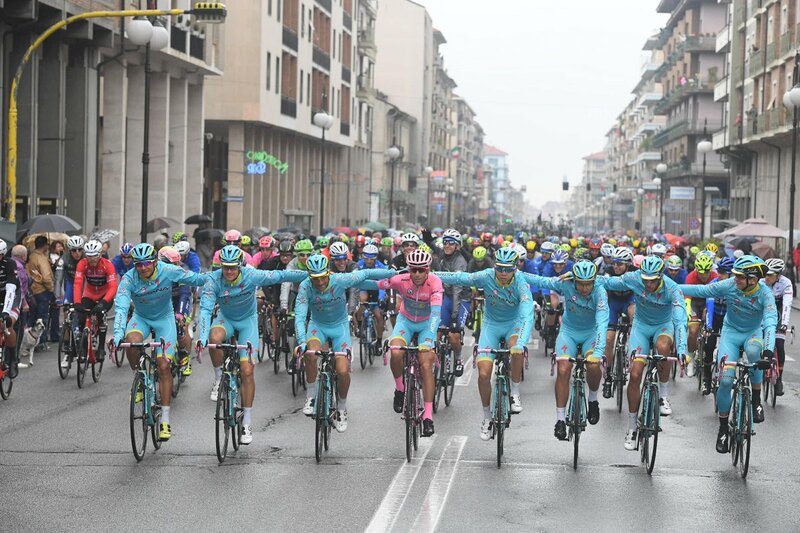 Nibali and his teammates are now in a group further back on the road. No worries for the Italian, who will now just roll home. Trek now take it up through Alafaci. Katusha up there with two men. Remember, many of the top sprinters that started the Giro (Kittel, Greipel, Ewan, Demare, Viviani) are not here. A great opportunity for the likes of Nizzolo. Sean de Bie comes through on the left and accelerates off the front. He has a small gap. Finally, Nizzolo the nearly-man has his Giro d'Italia stage win! Nibali messes around and joins arms with his Astana as he crosses the line. Nizzolo is mobbed by friends and family after the finish line. How good must that feel. Arndt was second there, and Trentin third. Modolo, who didn't look happy, was fourth. Nizzolo came bursting through but as the road curved in the finishing straight he did veer over towards the barriers and into the line of Modolo. We've just grabbed a word with Modolo, and he is not happy with Nizzolo's sprint. “It’s finally come, I’m very happy with this win. I had to fight hard. It was hard to control, as a sprinter it was hard on the legs but in the end it was all up here [pointing to his head]. We understand that the race commissaires are still reviewing the sprint finish to decide if Nizzolo should be relegated. Breaking: The officials have ruled against Nizzolo and the stage win has been awarded to Nikias Arndt. Amazing news. 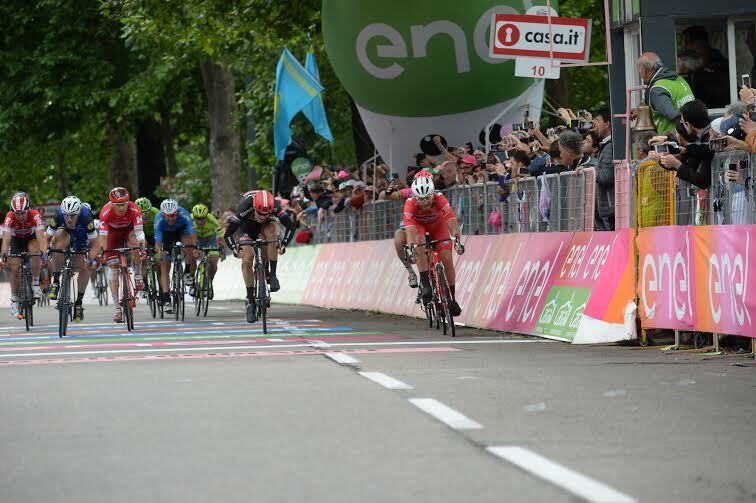 Nizzolo, who thought he had FINALLY ended his wait for a Giro stage win, has been declassified. After all those celebrations. Meanwhile at the podium, the tifosi roar in anticipation of Vincenzo Nibali. 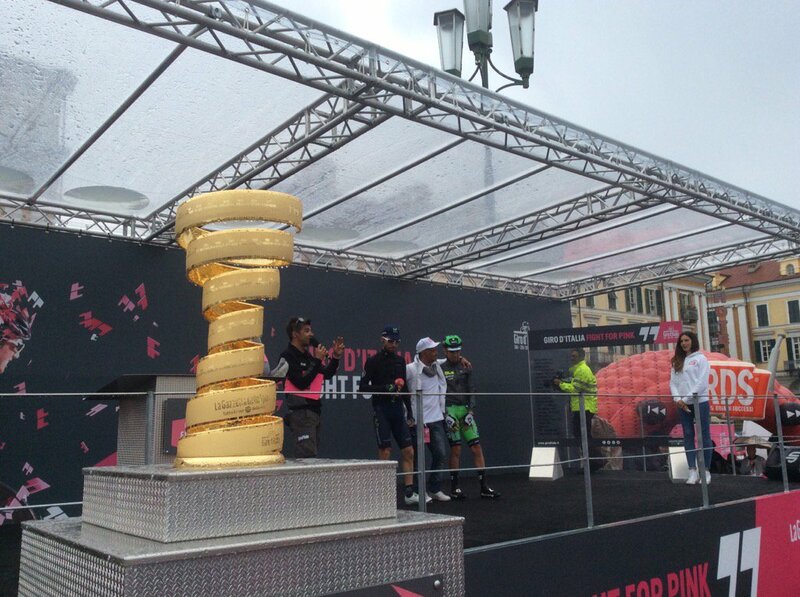 The Italian comes out to lift the Giro trophy for a second time. ITALIA! Nibali joins in heartedly with the national anthem. RT @TrekSegafredo: In our hearts we know who was the fastest in stage 21 at the 2016 #Giro. Nizzolo has to go onto the podium to collect his red jersey...and he does NOT look happy. Nikias Arndt is interviewed after being awarded the victory. "It's a good feeling to get the stage win. It was a hard race today and I think the team worked really hard for me. It was difficult to stay the whole day in position. In the end, it was a nice race with a good finish. I got a nice extra victory. "It was a difficult decision [official disqualified Giacomo Nizzolo for irregular sprinting]. It was a hard sprint with two hectic corners before hand. Everyone was very nervous and pushing each other. In the end, it was a decision of the jury about whether it was safe or not. For me it was a hard race." Our stage report, with photos and results, can be found here. 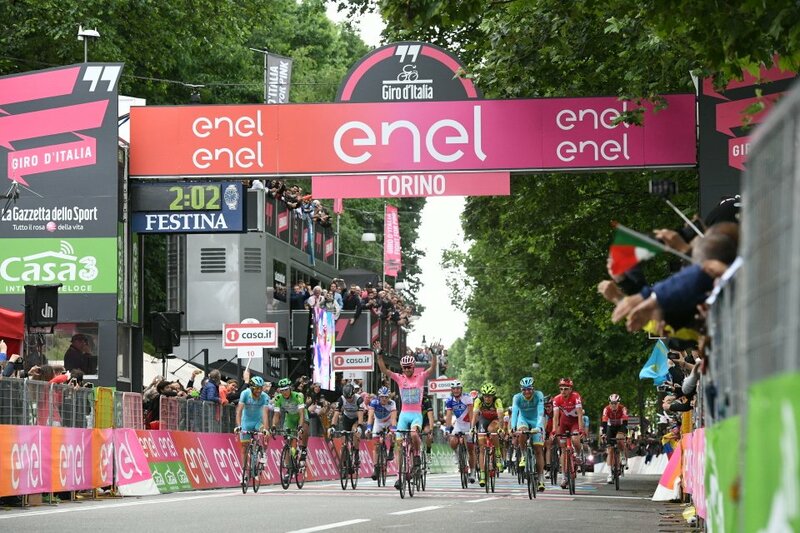 That's it for our live coverage of the 2016 Giro d'Italia. What a race it has been. The second half in particular provided drama that will not be forgotten in a hurry. Thanks for joining us on this three-week journey. Onto the next one.